Welcome to South Carolina butterflies. 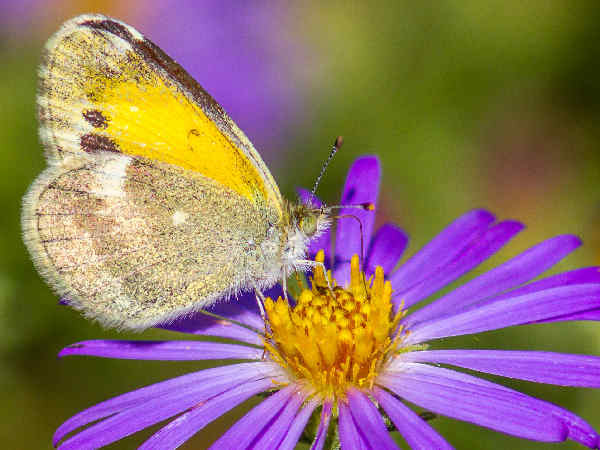 The small size of the state does little to diminish the state’s butterfly diversity. Like many states, South Carolina is characterized by the presence of many yellow butterflies, hairstreaks and brushfoots. 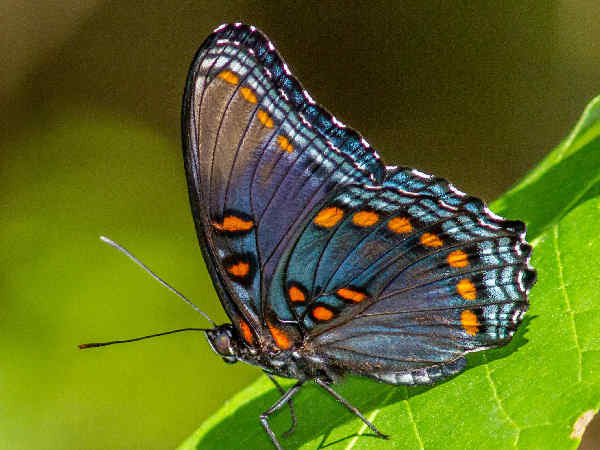 Also like many states South Carolina butterflies are loved by South Carolina residents to the tune of multiple butterfly houses opened across the state for residents to enjoy and learn about these important pollinators. At last count, there were five major butterfly exhibits ocurring in the state during the season. Wait, there’s more. The Master Gardener’s at Swan Lake in Sumpter want you to know about their butterfly garden. The list can continue and the moral of the story is clear. Preserving South Carolina butterflies by actively promoting butterfly gardens is a top goal for all South Carolinians. As an added bonus, all visitors to the state have multiple opportunities to catch up on their butterfly photography in a nice afternoon adventure. This brief introduction to South Carolina butterflies divides the group according to family, which also means in many instances dividing them according to wing color. Space limitations mean that only a handful of butterfly pictures can be included. Please click on the green butterfly button for additional butterfly pictures and information. Pieridae is the formal name of the family that consists of the butterflies with white wings and yellow wings. South Carolina has the typical list of yellow butterflies for a Southern state. Fortunately for butterfly enthusiasts most of them have a state wide distribution and can be found flying throughout a good part of the year. The picture shows a Dainty Sulphur. 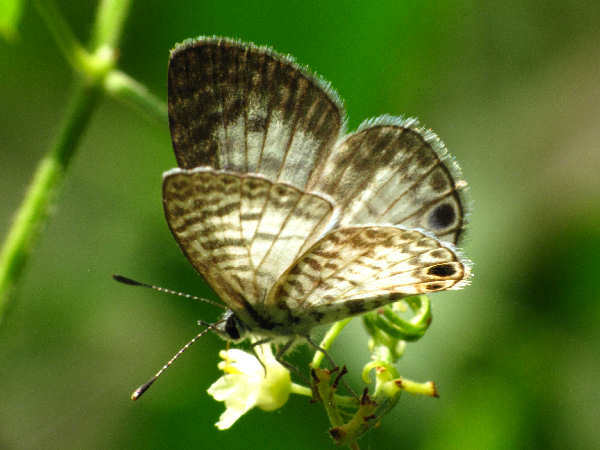 They ranks as the smallest of the yellow butterflies and are often found at ground level. 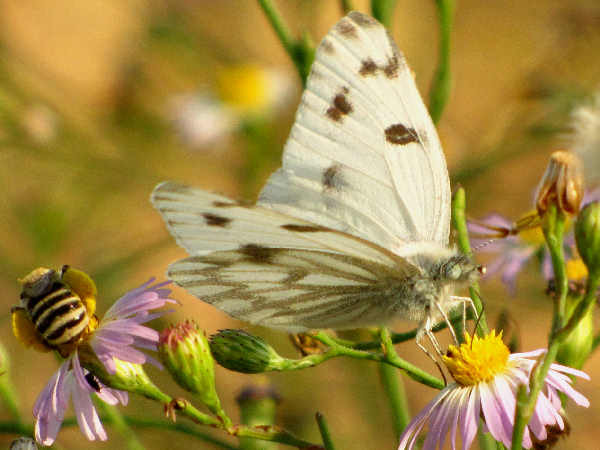 The small number of white butterflies in South Carolina is also typical for Southern states. The West Virginia White is a mountain butterfly and found in the west. No doubt most people are familiar with the Cabbage White butterfly because the caterpillars eat leaves from plants in the cabbage family, common garden vegetables. They fly around residential neighborhoods whenever there are back yard gardens in action. The picture shows a Checkered White. The wing pattern makes it easy to identify. Most states have more of the yellow butterfly species. Here’s a list of the rest of the white butterflies and yellow butterflies documented in the state. Most South Carolina residents will see the Tailed-blues and Azures in most of the state. Holly Azures are coastal plains species. The most interesting story of blue butterflies in the state is the story of the Cassius Blue Butterfly, pictured. Historically it is more of a subtropical species with populations in Florida and Texas. In the past twenty years, it has been discovered in Charleston and Horry counties. South Carolina hairstreaks, while plentiful in species numbers, are also a hard to get item. 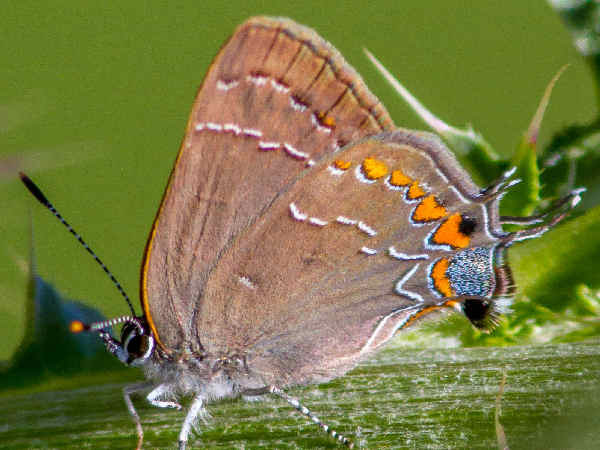 Some, such as the Oak Hairstreak, are rare finds. Others such as the White M are more wide spread, but still not easy to find. Other species such as the Red-banded Hairstreak have flexible habitat preferences and are therefore more common and broadly distributed. Keeping an eye out for small butterflies on shrubs might be the best tip for finding any hairstreaks in the area. Brush footed butterfly diversity in the state follows a similar Southeast pattern. Visitors usually have little problem seeing many of these species. Look for the butterflies with orange colors in the wings. There are exceptions to the orange color in the wing, as the picture of the Red-spotted Purple butterfly shows. It’s a very common species. The ten Wood Nymph and Satyr species might be more difficult to find for the average tourist, unless they take outings to local parks. Like other southern states, only one metalmark species, the Little Metalmark, calls South Carolina home. 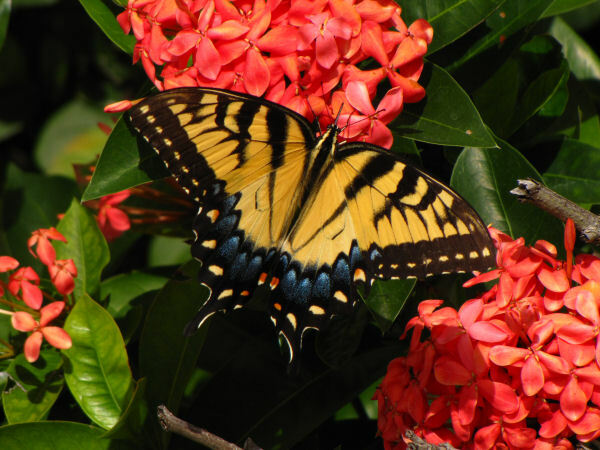 South Carolina has a few less Swallowtail butterflies than the average southern state. These are the larger butterflies that nectar on flowers in most residential areas and around tourist areas. The state butterfly is the very common Eastern Tiger Swallowtail, pictured at the top of the page. The picture under this section shows a Zebra Swallowtail. Look for them where ever the Pawpaw tree grows. It’s the larval host plant (tree).